Learn how Enterprise Risk Management (ERM) can assist in developing the tools your business needs to define, challenge and execute its strategy. ERM is no longer for the guys in the corner playing with financial models or documenting risks that will never move beyond their own desks. 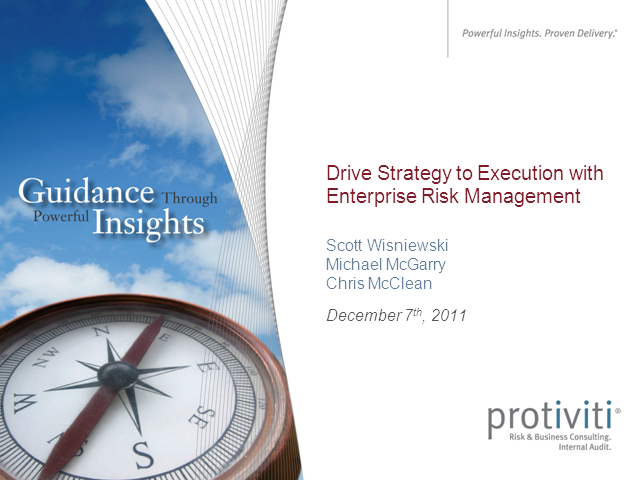 After a decade of high-profile business failures and ensuing financial recession, companies are being asked, âWhere was risk management?â The responses vary â some valid, some less so â however, it has led many to agree that ERM was not sufficiently focused on the critical issues, and if implemented effectively, can better equip management with the tools to execute the strategy. Protiviti and Forrester will share the perspectives gained from client inquiries, discussions and engagements to provide insights regarding ERMâs contribution to companiesâ execution of strategy, and how the effective usage of technology promotes this effort.